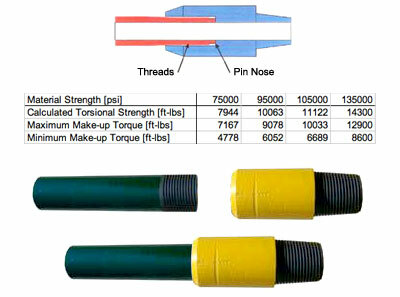 Nugent Special Thread Corp. (NST®), Holly Pipe's CNCmachine shop, is capable of threading its own NST connection as well as all rotary shouldered threads including drill pipe connections, pipe casing connections, dual flow subs, customer designed threads or older obsolete threads. All of NST’s drilling tools are inspected with the same level of quality assurance to minimize wear and maximize performance of the drill string. Our extensive machine Available Tubulars allows us to handle material from 3/8” to 35” OD. Click here to view our machine shop’s lathe and mill equipment along with the capacities of each machine. To accommodate the demand for quick turnaround in the manufacturing industry NST employs the use of both manual and CNC lathes and mills. Manual lathes and mills are used for one and two part jobs, and for high volume production CNC lathes and mills perform the work. NST is equipped with the latest in state-of-the art machining equipment to comply with API Q-1 standards (license number: 7-1-0850). NST can mass produce a variety of common drilling tools, but if you have an idea for a custom tool we can assist you with drill string design and manufacturing. Let us know how the tool will be used to assure maximum effectiveness. 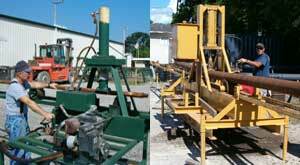 Water well drill pipe is typically manufactured by shortening 31’ to 20’ pipe and milling wrench flats on the box end. Our 3 ½”15.50# print shows the in-house pin connection for water well drillers. Bent drilling tubulars are common in the drilling industry, and Holly Pipe is equipped to handle straightening of any drill pipe, heavy weight drill pipe or drill collar. Straightening comes first before cleaning or any other inspection. Individual tubulars are placed in a hydraulic press to carefully and accurately correct the tubing while maintaining integrity. Holly Pipe also combines general welding and fabrication at our facilities to handle any drilling tool repair. Understanding the metallurgy and chemistry of certain materials in accordance with strength requirements enables us to execute proven welding techniques. 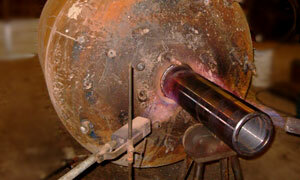 The drilling tools we produce are carefully heat treated to increase fatigue limitations. 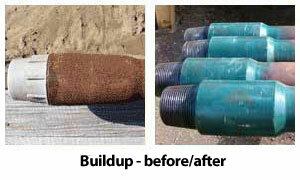 Refurbishing drill pipe and subs is a specialty of Holly Pipe and NST. In our effort to assist drillers, we welcome the opportunity to apply our products and services to utility and oilfield applications. Whether you need build up on tool joints, hard-band on drill pipe, refurbishing drill pipe connections or boring out the ends, we’re your one stop shop for reconditioning services on drill pipe. Refurbishing drill pipe and subs is a specialty of Holly Pipe, and we welcome the opportunity to help drillers drive ahead with premium reconditioned tools. We can buildup and hardband drill pipe, refurbish connections, or re-tool joint the ends of HDD pipe, or modify most tubulars by boring out the ends. 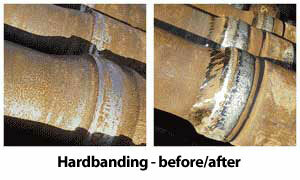 Holly Pipe can recondition HDD and utility drill pipe through a process we are very familiar with. Any pipe that does not conform to the inspection at any time will be separated from the batch. Only the pipe that contiues to pass inspection will go on to ronconditioning. First, we inspect the tool joint thicknesses. Second, a cleaning process on the O.D. & I.D. allows us to inspect the rest of the tube and tool joint areas. Third, we typically cut new connections on each side of the pipe and sub savers to screw on the pin side. 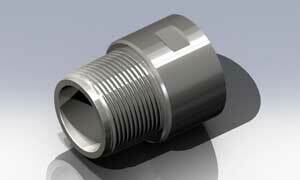 The sub savers allow pipe the additional length it needs to reach the correct shoulder to shoulder length (+ / - 1/4"). Fouth, the sub savers are permanetly bucked on pin side at 80% torsional yeild strength with thread locking compound. Finally, it is the customers preference weather thread lubrication and/or protectors are applied. New connections on used drill pipe, especially characterized by the “Double Shoulder” feature, can usually stand to have a make and break procedure done on them. Basically, the process involves making up two complete joints by their connections (BOX & PIN) and applying 80% of ultimate torque for that particular connection three times. Once connections undergo the three torques and show no signs of deformation, the connections are deemed “broke in," thus minimizing the risk of galling.